for my third year in a row (this time as an alumni) i`ve entered dare to be digital. first time round it was Ameboids which has since evolved into it`s own beast, and Shifting Dimensions which admittedly was hastily put together, since it was 4th year and all. Fianna is a far more cerebral concept. akin toa point and click adventure game,replete with a healthy sense of humour ala monkey island. to clarify, the game is obviously a collaboration between the entire team, currently known as team tartan paint. for a more thorough introduction of the team, watch the initial pitch video. 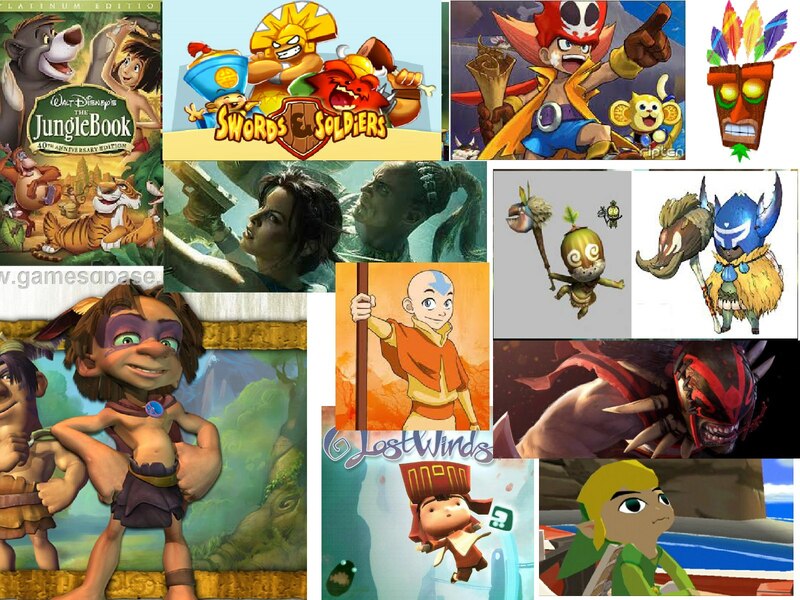 for this blog post,im going to detail the games development from the very beginning. initially we envisioned it as a game where you could intersect elements in your environment to solve puzzles, and that was the basic idea. it evolved a lot in the beginning, at one point we thought of having the main character as an evil robot, or a tropical shaman. here’s a super rough image showing off the basic premise. as you can see, the idea of drawing (more like robbing) elements from things could be viewed as somewhat nasty, sapping the life from everything in sight to further your own progress seems like such a renegade play style. I think it was the “greedy” style of gameplay which fueled the possibility as playing as an evil character. and a mood board for the character style. 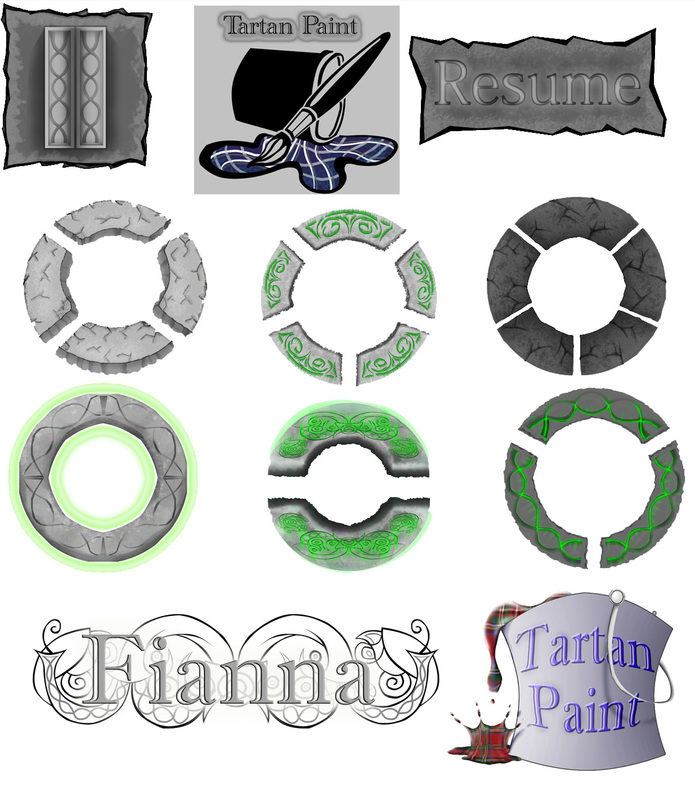 we eventually carved our own collective niche as a Scottish/celtic branded theme concept. which felt fitting to our original vision yet original and innovative enough to hopefully get the judges attention. another strong influence I forgot to implement in the collages, is scribblenauts. a strong point of our gameplay, was for it to be playful and experimental. puzzles could have many solutions, and despite the scenarios being heavily scripted we would like it to be fluid and filled with humourous interactions. somewhat similar to the sandbox nature of scribblenauts`s puzzles. the character mood board I composed was somewhat irrelevant as I decided to focus my attention on environments and user interface. however, I did do a few photoshops and touch up of jurgita`s many character sketches. 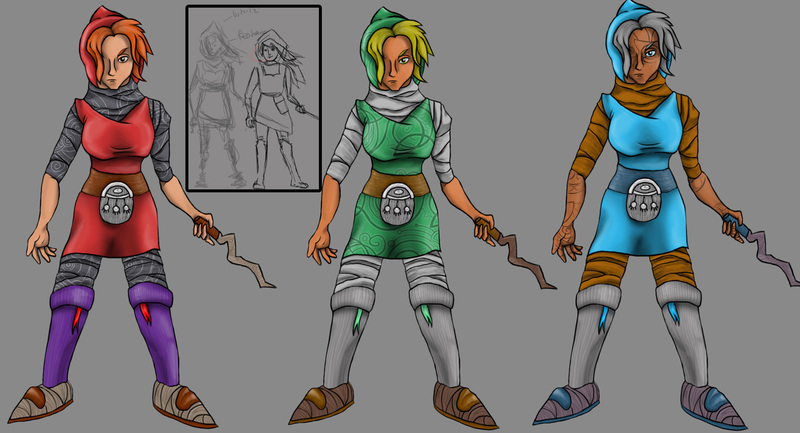 another feisty female character, the warden/guard type NPC. she`s designed to guard a gate/watch tower of sorts, hence the weaponry. 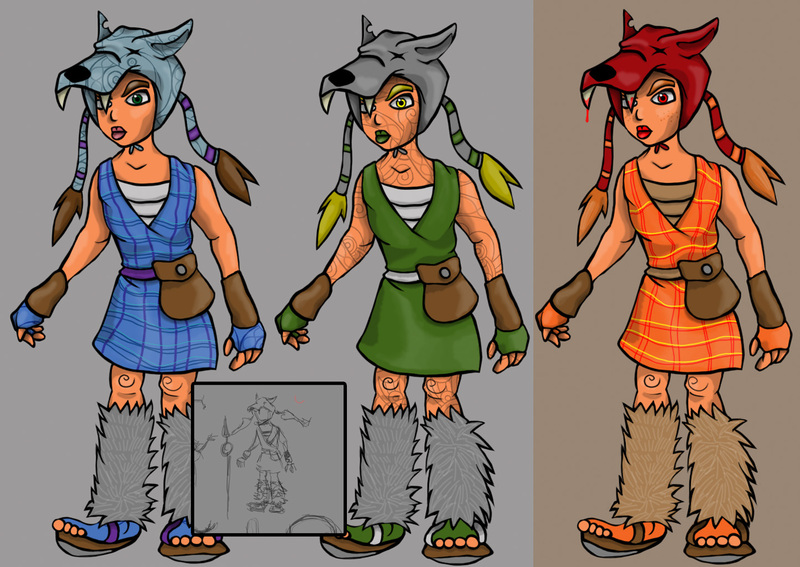 I tried to keep the traditional Scottish attire influence to a minimum, as too much would just seem forced. I hope I struck a good balance with her design. and a chieftain/more viking-esque character. we didn’t initially plan for an all female roster. the designs organically grew that way. and easily my favourite, the shaman type sage girl. as you can see, derived from one of jurgitas concept drawings. all of the character sheets are mainly from me being so fond of some of the ideas I wanted to expand upon them. it also gave us some great material to show off in our pitch video, but maybe at the expense of clashing/mixed art styles. you really can’t underestimate the value or working together in a shared office space, “patchy” art style was a feedback from the judges, art style guide sheets are now at the forefront of my radar when working in a team. 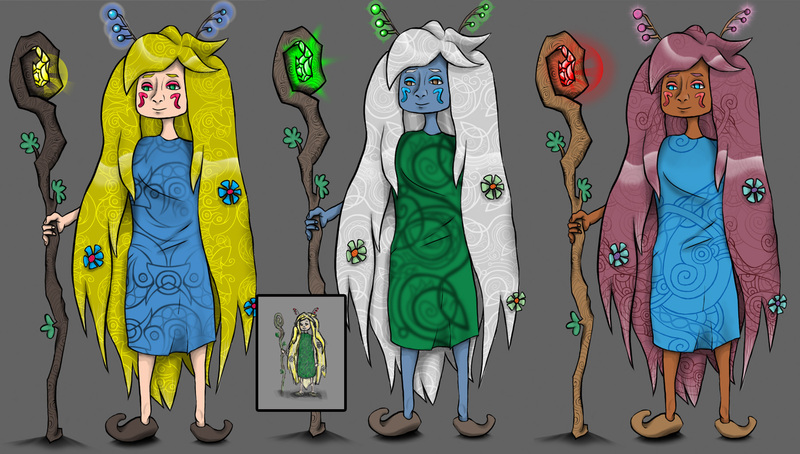 the Baird spirit guide character. obviously photoshopped from jurgitas concepts. our most recent interpretation of Baird is to have him behave like a Navi style companion, who comments on all puzzle interactions. such as what the effect of what you just did had etc as to keep the player informed in the games logic, and to hopefully interject some humour. he`s also planned to behave as a cursor for touch screen controls. 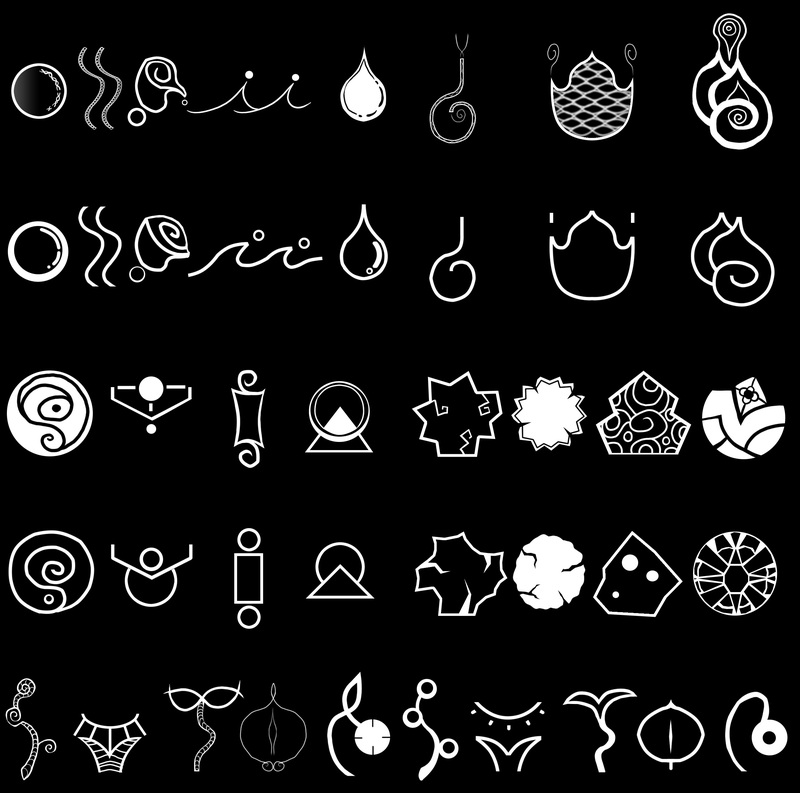 speaking of elements, I conceived a lot of different possible designs for each element. I initially drew about 50 rough ideas for each one, then refined it down into what you see here. they`ll be going through just one more revision, to be more rounded and fit better into the Baird UI. 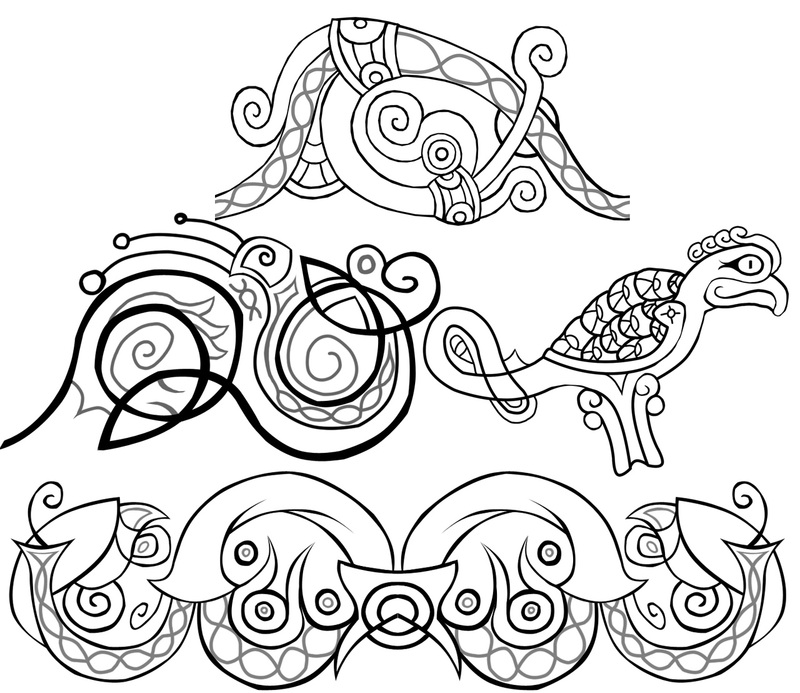 speaking of symbols, here are some assets inspired by actual celtic symbology. 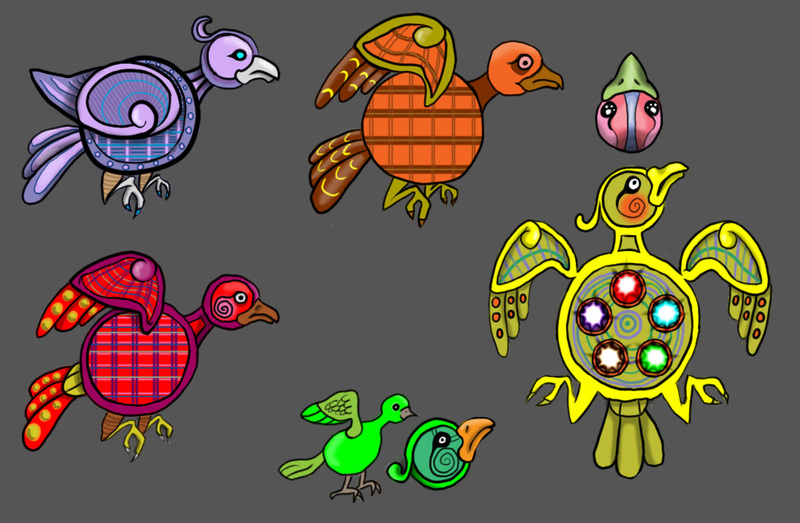 purposed to be used as a texture in the game, as you`ve probably spot in a lot of the art so far. one more UI thing to show off. certain elements can have up to 4 element slots (originally 5) here’s some conceived round runes and menu buttons & logos. now onto the environments. you`ve seen jurgita`s animatic in the video at the top. when I started doing the more polished environment concepts it was hard to break away from my usual style. I went into far too much detail, jurgita`s original concept had a sort of tactile, painted look to it, its good and sticking to a simple style and doing it justice is far harder, then how I usually work, namely by throwing a bunch of filters & textures on top of stuff to get them decent looking, and I think it lost us points from the judges because of the mix in styles. I did try a lot of different techniques to get as good a fit/look as possible. leafs in the foreground, bent and swirling to take the shape of celtic symbology. 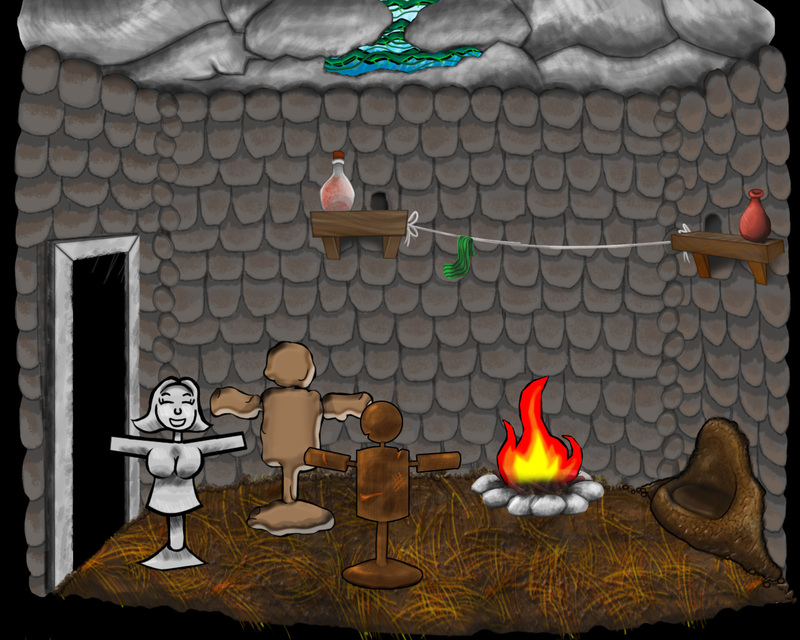 the villagers huts in the first level. I was really fond of the pattern on the main walking field. the trees in the background have an almost, semi protruding look to them. reminded me of Yoshi`s story. and of course the symbology clouds,i felt like a genius when I made those 😀 felt like an art breakthrough. 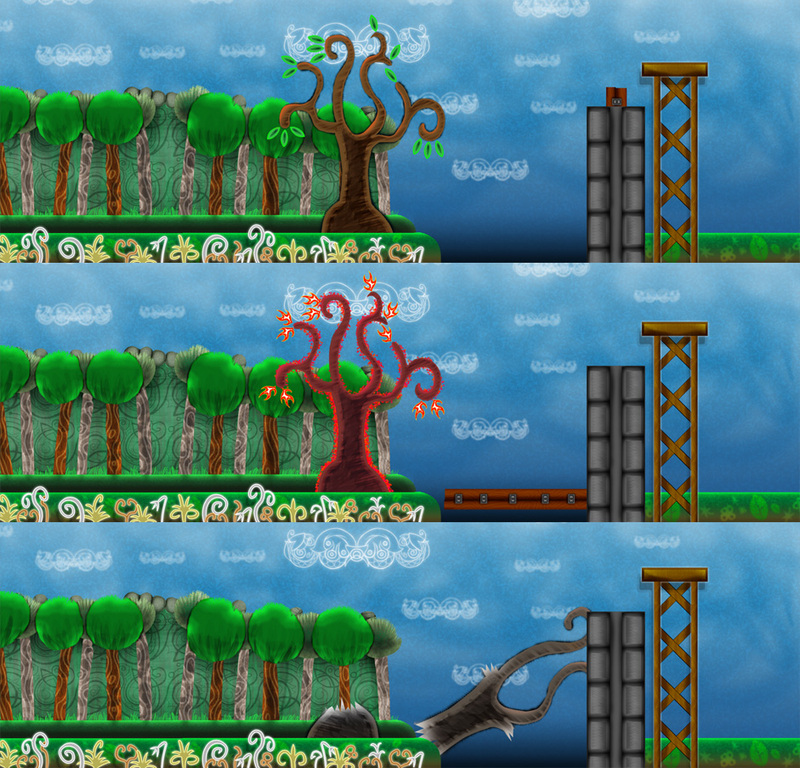 and the other side of the forest level, the tree puzzle and the watchtower/drawbridge. here you can see all the variations of the tree, on fire (causes the guard to lower the bridge and come across to extinguish it and prevent a forest fire) or lifeless and dead = snaps and creates a makeshift bridge, allowing you to enter the village. 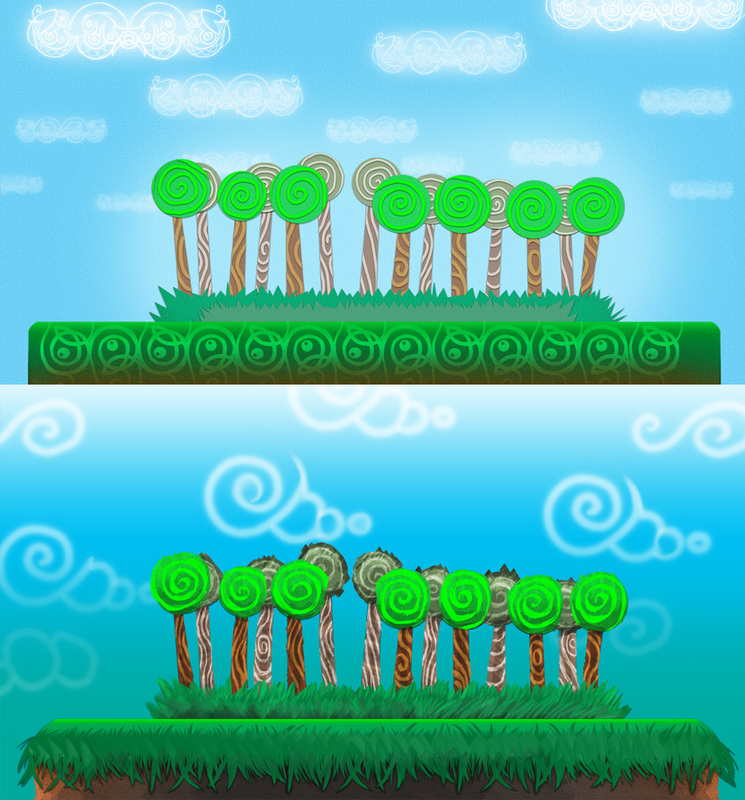 some more style experiments for the forest. 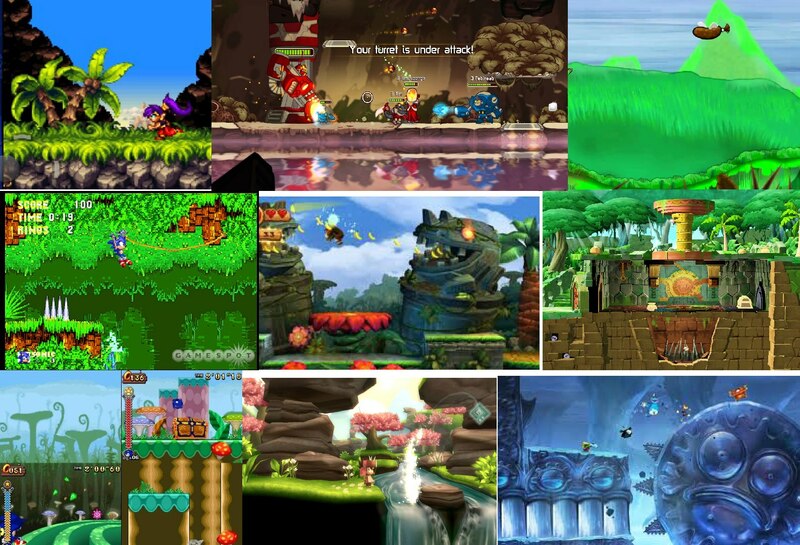 top image is Very Yoshi’s story. I quite like the main field on the bottom one. and one more, mucking around with a possible fog/depth of field effect. now onto the next scene, one of the puzzles later on in the game, was a hermits house inside some underground caves. it was a much more advanced puzzle than the tree, and this is reflected in the number of states a simple rat could assume from all the different element combinations, observe. its pretty bizarre and hilarious in context. here’s the hermit hut environment in which the poor abused rat resides. simply a scene composed to show off all the assets, for a better idea of how it plays, observe the video below.